The toponym Delmarva is a clipped compound of Delaware, Maryland, and Virginia (abbreviated VA), which in turn was modeled after Delmar, a border town named after two of those states. While Delmar was founded and named in 1859, the earliest uses of the name Delmarva occurred several decades later (for example on February 10, 1877 in the Middleton Transcript newspaper in Middleton, Delaware) and appear to have been commercial; for example, the Delmarva Heat, Light, and Refrigerating Corp. of Chincoteague, Virginia, was in existence by 1913—but general use of the term did not occur until the 1920s. 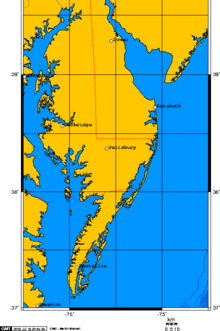 The entire Delmarva Peninsula falls within the Atlantic Coastal Plain, a flat and sandy area with very few or no hills; the highest point in the peninsula is only 102 ft (31 m) above sea level. The fall line, found in the region southwest of Wilmington, Delaware, and just north of the northern edge of the Delmarva Peninsula, is a geographic borderland where the Piedmont region transitions into the coastal plain. 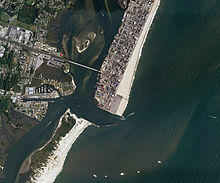 Its Atlantic Ocean coast is formed by the Virginia Barrier Islands in the south and the Fenwick Island barrier spit in the north. The culture on Delmarva is starkly different from the rest of the Mid-Atlantic region and is much like that of the Southern United States. Many Delmarva counties are much more conservative than the "mainland" counties of Delaware, Maryland, and Virginia. Delmarva is driven by agriculture and commercial fishing. Most of the land is rural, and there are only a few large population centers. Many dialect studies show that Delmarva residents have a variation of Southern American English which is particularly prevalent in rural areas. All three counties in Delaware—New Castle (partially), Kent, and Sussex—are located on the peninsula. Of the 23 counties in Maryland, nine are on the Eastern Shore: Kent, Queen Anne's, Talbot, Caroline, Dorchester, Wicomico, Somerset, and Worcester, as well as a portion of Cecil County. Two Virginia counties are on the peninsula: Accomack and Northampton. At various times in history, residents of the Delmarva Peninsula have proposed that its Maryland and Virginia portions secede from their respective states, merging with Kent County and Sussex County, Delaware, to create the state of Delmarva. A Delmarva State Party with this aim was founded in 1992. Its combined population would be about 750,000, roughly that of Montana, or 977,511 in 2015, or 1,534,290 if New Castle County, Delaware is also included, roughly the population of Idaho, or West Virginia. Legislative attempts to break the Eastern Shore counties of Maryland away and join Delaware were made several times. In November 1776, delegates from the Eastern Shore attempted to insert a clause into the Maryland Declaration of Rights that would allow the shore counties to secede from Maryland, with the clause being defeated 30–17. In 1833 came the closest secession movement when a Delaware resolution proposing the Eastern Shore of Maryland be absorbed into Delaware passed the Delaware Senate and Delaware House of Representatives, it then passed the Maryland House of Delegates with a 40–24 vote, but failed to be voted out of committee by the Maryland Senate. The following year, a Caroline County representative proposed allowing the Eastern Shore to secede via referendum, but the Maryland House of Delegates voted 60–5 to indefinitely postpone the measure and that proposal was never taken up again. In 1851, Dorchester County delegate and future Maryland Governor Thomas Holliday Hicks proposed an amendment that would give the Eastern Shore the right to vote itself into Delaware, but the amendment failed 51–27. Recent research indicates that Paleo-Indians inhabited Maryland during the pre-Clovis period (before 13,000 BP). Miles Point, Oyster Cove, and Cator’s Cove archaeological sites on the coastal plain of the Delmarva Peninsula help to document a pre-Clovis presence in the Middle Atlantic region. Thus, these sites suggest a human presence in the Middle Atlantic region during the Last Glacial Maximum. In 1970 a stone tool (a biface) said to resemble Solutrean stone tools was dredged up by the trawler Cinmar off the east coast of Virginia in an area that would have been dry land prior to the rising sea levels of the Pleistocene Epoch The tool was allegedly found in the same dredge load that contained a mastodon's remains. The mastodon tusks were later determined to be 22,000 years old. In addition several archaeological sites on the Delmarva peninsula with suggestive (but not definitive) dating between 16,000 andir settlements relocated as natural conditions dictated. They set up villages – scattered groups of thatch houses and cultivated gardens – where conditions favored farming. In the spring they planted crops, which the women and children tended while the men hunted and fished. In the fall they harvested crops, storing food in baskets or underground pits. During the harsh winter, whole communities would move to hunting areas, seeking the deer, rabbit and other game that kept them alive until the spring fishing season. When the farmland around their villages became less productive – the inhabitants did not practice crop rotation – the native people would abandon the site and move to another location. 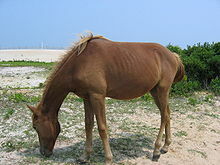 The primary Indians of the ocean side of the lower peninsula prior to the arrival of Europeans were the Assateague, including the Assateague, Transquakin, Choptico, Moteawaughkin, Quequashkecaquick, Hatsawap, Wachetak, Marauqhquaick, and Manaskson. They were all under the guidance of the Chief of the Assateague. They ranged from Cape Charles, Virginia, to the Indian River inlet in Delaware. The upper peninsula and the Chesapeake shore was the home of Nanticoke-speaking people such as the Nanticoke and Choptank. The Assateague and Nanticoke made a number of treaties with the colony of Maryland, but the land was gradually taken for the use of the colonists, and the native peoples of the peninsula assimilated into other Algonquian tribes as far north as Ontario. In 1566, an expedition sent from Spanish Florida by Pedro Menéndez de Avilés reached the Delmarva Peninsula. The expedition consisted of two Dominican friars, thirty soldiers and a Virginia Indian boy, Don Luis, in an effort to set up a Spanish colony in the Chesapeake. At the time, the Spanish believed the Chesapeake to be an opening to the fabled Northwest Passage. However, a storm thwarted their attempts at establishing a colony. The land that is currently Delaware was first colonized by the Dutch West India Company in 1631 as Zwaanendael. That colony lasted one year before a dispute with local Indians led to its destruction. In 1638, New Sweden was established which colonized the northern part of the state, together with the Delaware Valley. Eventually, the Dutch, who had maintained that their claim to Delaware arose from the colony of 1631, recaptured Delaware and incorporated the colony into the Colony of New Netherland. The peninsula was the premier location for truck farming of vegetables during the 19th and early 20th centuries. Though it has been largely eclipsed by California's production, the area still produces significant quantities of tomatoes, green beans, corn, soy beans—Queen Anne's County is the largest producer of soy beans in Maryland—and other popular vegetables. Until 1965, the Pennsylvania Railroad provided service to the peninsula. It ran the Del-Mar-Va Express day train from New York City, through Wilmington, Dover, Delmar, Salisbury, and Pocomoke City to the Cape Charles, Virginia ferry docks and it ran the Cavalier counterpart night train. At that point, ferries ran to Norfolk, Virginia. In earlier decades branches ran to Centreville, Maryland; Oxford, Maryland; Cambridge, Maryland; Georgetown and Lewes, Delaware; and to Franklin City, Virginia. Today, the Delmarva Central Railroad provides freight and tanker transportation on the peninsula.